Slashing its sharpened machetes together and letting out a deafening screech, the bark-clad beast known as a konkoran races through the market scattering women and children as they go about their morning shopping. Turning off down a residential side street in the southern Senegalese town of Ziguinchor, the frightening figure makes its way towards a family compound, accompanied by an entourage of dancing and singing young men. Here they will find young boys who have recently been circumcised and who, according to the Mandingo people, are vulnerable at this time to attacks from evil spirits. The beginning of Senegal's rainy season and the circumcision period, in which boys as young as three will symbolically become men, coincides with the announcement by the World Health Organization (WHO) that male circumcision could prevent millions of new HIV infections. The study found that in places such as Senegal, where circumcision is commonly practised, HIV is less prevalent than in places where the practice is less widespread, such as in South Africa. A separate WHO report says that demand for male circumcision as a method of combating HIV/AIDS is likely to increase dramatically in southern African countries. 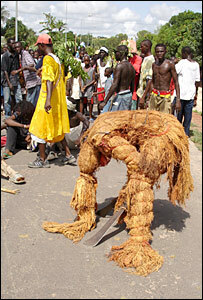 However, concerns over traditional ceremonies - such as this one in Senegal - in which the health of the initiates may be put at risk because of exposure or unsanitary conditions, means that more circumcisions may be performed in hospitals by trained medical personnel rather than in the traditional manner. In the village, the konkoran doesn't walk on earth but flies. Nowadays, these kids do whatever they like. At the family compound of low white-washed concrete houses, the young men of the Ndiongue family bring their newly-circumcised sons from their hiding places as the konkoran in its costume of sacred red tree bark whirls through the compound gates. With the young boys on their knees, the benevolent but violent beast circles them, chasing out the harmful spirits that are thought to cause illness or misfortune in later life. "In Africa, there are things that we believe in and one of them is that there are bad spirits who want to harm the child while he's going through this vulnerable period. "The Konkoran is working against that," says Ibrahima Ndiongue, 78, grandfather and great-grandfather to the three recently circumcised boys. The elaborate rite will end when the boys are healed and taken to the sacred forest to learn the essentials of being a man. Overnight, under the protection of the konkoran, they will be washed in sacred water, emerging the next morning as grown-ups. But, says Ndiongue, the power of the ancient rite is waning, even though it is hugely popular amongst young Mandingo men in the region. "This that you see in town, it's not the real konkoran," says the old man, dressed in a long robe and Muslim skullcap. "In the village, the konkoran doesn't walk on earth but flies. Nowadays, these kids do whatever they like." The ritual of the konkoran is strictly the preserve of men. Female circumcision, or genital mutilation, was banned in Senegal in 1999. 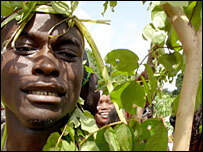 Traditionally, women would not set eyes on the circumcised boys who in the days when Ibrahima Ndiongue was young, would spend up to three months in the forest learning the art of being a man. "You learn about life, how to live with people, to be polite and wise," says Mr Ndiongue, recalling his own three months in the forest. Traditionally, women were also strictly forbidden from seeing the konkoran, locking themselves inside the house when it came to the compound. But Rama N'Diaye, one of Mr Ndiongue's 10 surviving children, says that this aspect of the ritual is changing too. "Before, women would not even go to the door to look at the konkoran. Now, women are allowed to look from afar," says the 31-year-old hairdressing student. Despite this, when the mythical beast appears in the neighbourhood, women and children still scatter. "I am very afraid of him," says N'Diaye. "You just look at him and you feel afraid."